Jetsün Mingyur Paldron was born in 1699 in the Earth Rabbit year as the daughter of Chögyal Terdag Lingpa and his consort, Phuntsok Paldron. By 13 years of age, she had received extensive instructions and teachings from her father and had accomplished many practices. Chögyal Terdag Lingpa passed into Parinirvana in 1714. In 1717, the Dzingar Mongols invaded Tibet and began destroying monasteries. Being in Central Tibet, Mindrolling was an easy target of this as well as other invasions. The Mongols razed the monastery and killed Lochen Dharmashri, brother of Terdag Lingpa, and Pema Jurme Gyatso, his eldest son. The younger son, Gyalsay Drinchen Rinchen Namgyal, managed to escape into Kham through the help of the family of the Khochhen Rinpoche. Jetsün Mingyur Paldron also escaped to Sikkim where she lived and taught for two years, turning the wheel of Dharma for many fortunate beings, firmly establishing the Dharma in Sikkim. Mingyur Paldron also founded the Pema Yangtse monastery there. After the Mongols left Tibet, Jetsün Mingyur Paldron, who was then twenty years of age, and her younger brother Drinchen Rinchen Namgyal, returned to Mindrolling. They found it in ruins. Together, with their courageous and tireless efforts, they re-built the monastery and re-established the sangha, making Mindrolling once more the center of learning and transmission of the Dharma. At the age of thirty-three, Jetsün Mingyur Paldron gave the empowerments, oral transmissions and explanations of the collected works of Chögyal Terdag Lingpa and the Nyingthig Yabzhi to over 270 disciples and thus insured the continuance of these precious transmissions. Jetsün Mingyur Paldron also established the Samten Tse nunnery a short distance from the Mindrolling monastery. It was there that she spent most of the remainder of her life, practicing, teaching and composing many precious texts and inspiring many to follow the path she embodied. Jetsün Mingyur Paldron passed into Parinirvana at the age of 70 in 1769. 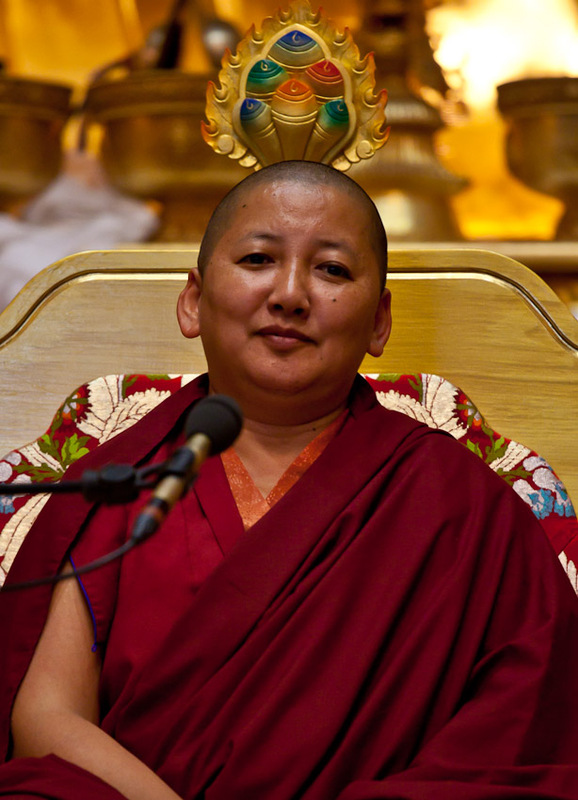 The life of this great female master is an inspiration to all practitioners, especially women, to practice and realize the pure Dharma for the sake of all sentient beings. Jetsün Thrinley Chödron was born as the daughter of Tri Thrinley Namgyal. As an ordained nun, she received all the profound instructions from the lineage holders of Mindrolling and many great masters of the period. 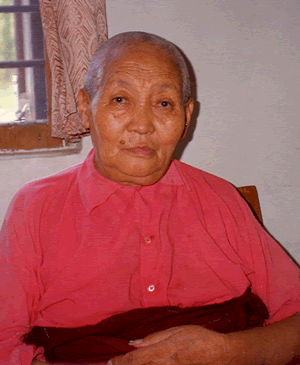 She taught widely, contributing greatly to the preservation of the Dzogchen lineage, particularly the Semde and Longde transmissions. 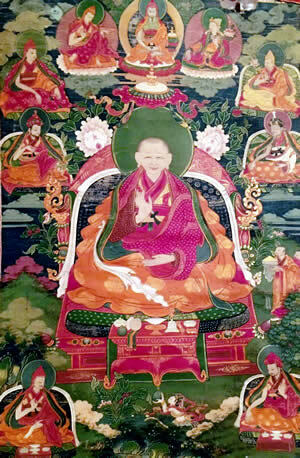 Jetsün Thrinley Chödron was one of the main teachers of the great Jamyang Khyentse Wangpo. Tsewang Lhamo was born as the daughter of Tritsab Pema Wangchen and was the grand-aunt to Mindrolling Trichen Rinpoche. Jetsün Tsewang Lhamo’s root guru was Jampal Dewei Nyima from whom she took her ordination vows and received the highest mind instructions. Jetsünma also received profound instructions and teachings from Khenchen Khyentse Norbu and Chung Rinpoche.